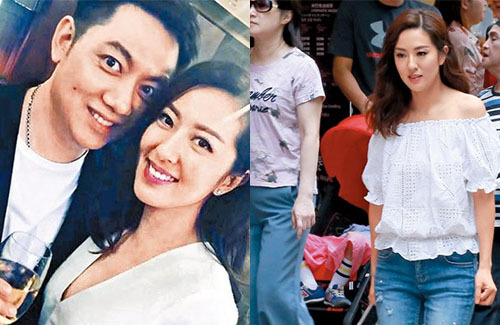 When Natalie Tong (唐詩詠) and Tony Hung (洪永城) announced their split, it was rumored that their breakup had something to do with Andrew Lo (盧啟邦), a close staff member of Alvin Chau (周焯華). But whether or not that rumor holds true, Andrew and Natalie no longer seem to be an item, as it is known that the businessman has been dating “long-haired” woman YoYo for a while now. Paparazzi had spotted Alvin taking his girlfriend back home. Whatever the case may be, one can’t help but to notice Natalie’s poor luck in her love life. The TVB actress made her debut in 2000, through the RTHK Youth @ Y2K <青春@Y2K>. At the time, she briefly dated her costar Shawn Yue (余文樂), but their relationship ended when he started dating Candy Lo (盧海音). In 2005, Natalie began a very stormy relationship with TVB presenter Amigo Choi (崔建邦), and they stayed on-and-off for several years. During their relationship, Amigo had cheated on Natalie three times; Natalie admitted afterwards that she known about them when it happened. After filming Rear Mirror <載得有情人> in 2013, Natalie grew close to Tony Hung. After filming the show, Tony got very vocal with the media about his affections for Natalie. They officially confirmed their relationship in early 2015. In May 2017, Natalie and Tony announced their split. According to their statements, Natalie and Tony broke up due to irreconcilable differences. They never went into detail why, but the paparazzi were quick to point fingers at Andrew Lo, who was said to be the catalyst of their breakup. Andrew is a known player among the circle, as he has been linked with stars such as Whitney Hui (許亦妮), Jeana, Iris Chung (鍾采羲), and pseudo model Hera.